Yesterday we hit the Sequoias. If you’ve fished Kings Canyon or Sequoia in other years, you might be surprised at the water conditions. Many of the small creeks that are almost done in late June and July are still really hot. The larger streams and rivers are still very treacherous- especially with the melt from this heatwave filling their banks. Marble Fork was blown out, and Clover Creek near Wuksachi Resort nearly so. Please check flows before you go. 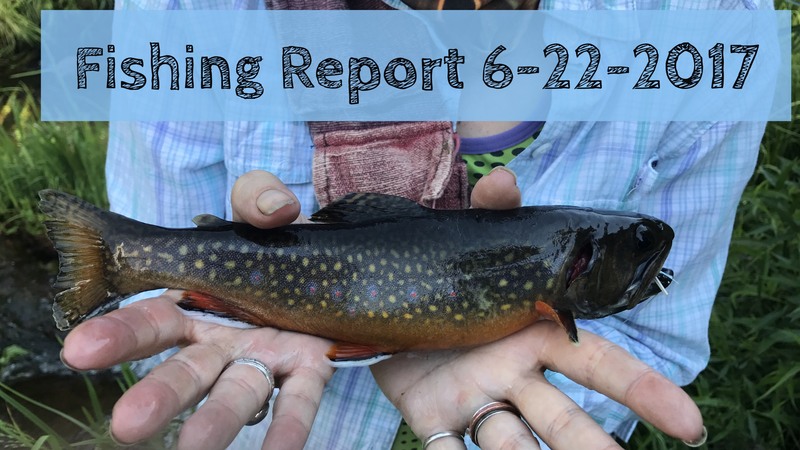 What we caught: brook trout and rainbow trout. What we used: a variety of dry flies – some Parachute Caddis, some Adams, and I used leggy foam beasties. Wet wading is doable- the water temps don’t immediately freeze your legs, but they’re still cool enough to keep the trout happy. As we were driving by Lake Kaweah on the way home, we noticed that it’s full- really, really, full. Like, you can’t see the high water line at all, and the outhouses are nearly covered- all you can see is the roof! Some kids had floated over to one of them, and were standing on the roof, fishing. Got a boat? There’s a lot of lake to play on right now. Added benefit: the temps in the park are much, much cooler than they are here. When we got home, it was after dark, and it was still warmer than it had been all day long up in the mountains. It was a great way to beat the heat.